It really is Christmas at Ifish! I hope you hook all your biggest wishes! I mean fishes! So, you don't know what to get the fishermen for Christmas? Ifish is swimming with ideas! How bout a Stan Fagerstrom Casting video for the kids? (Don't get me wrong, this is not for kids only. Bill and I learned so much from this tape!) I really want to stay out of the Nintendo/computer thing this Christmas, I want outdoors fun for the kids, but this is a perfect rainy day activity! This, with a coupon for a personal demonstration out on the water when it is nice out, will never be forgotten! For the home, how bout browsing through Fabs.org. They support Ifish, let's support them! They have really pretty things for the home, things that last... While you are at it, please enter their contest! Speaking of Contests, there is a new one going on! Pat Reichner from Holdzit.com (you know, the guy with the hook file sheaths) is offering $20.00 worth of free merchandise a week till Christmas for entering. Go see here! This weeks contest is "Hottest fishing Tips" Lots of good entries are coming in and the deadline is Monday. How about adding something nice to your walls? These metal fish are just beautiful! I have two on my wall, and when the light hits them, they are gorgeous! Don't forget to put in some Shrimp Scent, or a gift Certificate to Tillamook Bait.com. Marie is as busy as an elf getting everyone supplied, so order now! Luhr Jensen has some great stocking stuffers, and is a new ifish supporter! Yay! Everything here is a winner! Of course, the ultimate in all fishing gifts for the fishermen is a guided trip or charter! Think ahead and reserve one! This is a wonderful thing to do as a family! Father and son, Mother and daughter, whatever! You'll find all the charters and guides listed in the left hand column. Add a night at the Shilo for two, and you and your wife can both have a wonderful time! In fact, the whole family! Yeah! Reserve a guided trip for the whole family and 2 nights at the Shilo at any coastal location and whee! One stop shopping! I would love some Amerman eggs in my stocking. In fact, I have gotten a batch of eggs for Christmas for as long as I can remember! OK, the ultimate of all gifts.... The things we dream of.... the thing I want more than anything.... Here goes! 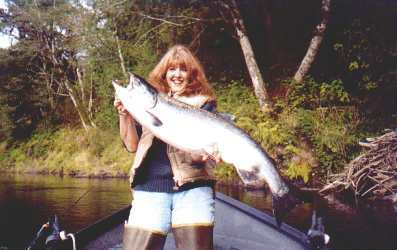 Click here for Chris Sessions, reserve an Alaska fishing trip, then call Clam Gulch Lodge and make it a package deal. A trip to Alaska, fishing with Chris Sessions, and a week at the Clam Gulch Lodge? Whoo hoo! That is the ultimate Merry Fishmas gift for the whole family!! For a more personal approach, try the Tillamook Bay Front Vacation Rental, that gives you perfect access to Memaloose fishing for Spring or Fall Chinook! Oh! And don't forget those special fishing items you are searching for, go to Bigfish Tackle and Forest Bay! Search their specials for great deals! "Yeah, I drove by the Wilson, and it looked like there'd been an aluminum hatch down there.... so I came over here." The thing I would like to get Andrew most this Christmas is a pair of used ski boots. That is one tall order. Andrew's feet are a size 17, pushing 18 really fast. This is, I suppose, a part of living with Marfan Syndrome. I have had trouble all my life with my feet, but nothing of this proportion. Long, skinny feet. Mine are a 11 AAAA, and you can find them if you look really hard. Andrew is advised not to play competetive sports like basketball, soccer, baseball, track, due to his aortic aneurysm. Chris Patton, the basketball player who died on the court had Marfan, so did Flo Hyman, the volleyball player, so I guess they are right, not a good idea. It is fairly safe to fish, roller blade, downhill ski, etc. Not without the proper foot attire! I looked in the La Crosse catalogue. No knee boots or hip waders either! I guess we could wrap those long feet in garbage bags for waders? I dunno. I really could use the magical help of Santa Clause. Where do I write him? I was wondering what the likes of the Blazers and other NBA player types do for things like this. Anyone know how to get an answer? We have gone on an annual ski trip as part of our family Christmas gift for quite some time now. We rent skis, and last year, at 12 years old, he squeezed into a rental pair of 14s. Youch! This year? I don't know! Anyway, I will get the winner of the contest up a little later and have tons of internet work to do, so I'll be around. I think the next contest will be for the biggest fall steelhead caught this week. Remember, it has to be fin clipped! Send in a pic, or prove it to me somehow! The thing I would like to get Andrew most this Christmas, is a pair of used ski boots. That is one tall order. Andrew is 13 and his feet are a size 17, pushing 18 really fast. This is, I suppose, a part of living with Marfan Syndrome. I have had trouble all my life with my feet, but nothing of this proportion! Long, skinny feet. Mine are a 11 AAAA, and you can find them if you look really hard. Andrew is advised not to play competitive contact sports like basketball, soccer, baseball, track, due to his aortic aneurysm. Chris Patton, the basketball player who died on the court had Marfan Syndrome, so did Flo Hyman, the volleyball player, so I guess they are right, it's not a good idea. It is fairly safe to fish, roller blade, downhill ski, etc., but not without the proper foot attire! Even in the La Crosse catalogue, no knee boots or hip waders either! I guess we could wrap those long feet in garbage bags for waders? I dunno. I really could use the magical help of Santa Claus. Where do I write him? Anyway, I will get the winner of the contest up a little later and I have tons of internet work to do, so I'll be around. Next contest for Holdzit, "Fishing with Kids!" Yeah! It can be funny, amazing, or endearing. Just enter! I got some Holdzit products and had more fun last night getting out my steelhead gear and organizing it! Wheee! "Yuppie weather" Bill grumbles as he enters the kitchen. The air is still and cold, and even in the dark of the early morning he knows. The weatherman greeted us with the promise of yet another "beautiful day". "Yuppie weather... For joggers and Christmas shoppers and golfers... "Bill longs for the high green waters that bring steelhead streaking up river. I was drawn last night from the warmth of the wood stove, to the moonlight that shimmers on the river. I had to go stand out in the cold, to look and to listen. I talked David into joining me for a walk. We went armed with flashlights, but didn't use them at all. The moonlight guided us down the path to the river bank. "Listen!" I'd say, and our ears would fill with everything and nothing. We felt forced to whisper our thoughts. We stood quietly along the river bank and noticed that everything looked totally different, the same land we knew so well by the light of day, was totally undiscovered. If you stand long enough, and listen, the river plays the same song over and over. It becomes so familiar that your ears become keen to any change. A fish? A deer crossing the river downstream? Perhaps a beaver sliding down the bank and into the water? If you stand longer still, beside that river deep in that forest where the wild things live, you hear nothing, and then you hear everything! Screaming, we ran with all of our might from visions created in our imagination! Bear, cougar, who knows what, but David and I felt it at the same time! We dashed, like spooked deer, to the safety of the back porch, feeling as if someone, something was one footstep behind us! Breathless, we closed the door on that great, starry, moonlit sky, collapsing with giggles in the safety and warmth of our winter den. I stopped and spoke with a farmer over the Curl road bridge yesterday. I saw salmon laying in that hole, and perhaps one steelhead. I thought of how trapped they must feel in the low waters and mentioned that I wished it would rain. He disagreed. "I don't usually get to let my cows out in December. I love this weather, the cows love it." He smiled and gazed toward his cows grazing in the pasture, the trailer behind him overflowing with gobs noxious waste. "Yuck, that stinks!" I giggled. "I like the smell" He said. "Yuppie weather..." Bill grumbled.... For joggers and Christmas shoppers and golfers... and dairy farmers? Guilt is setting in. NOT! I'm going fishing two days in a row! Wheeeeeee! Please step away from the tracks. The new speeding freight train named "ThanksgivingChristmasNewYears" is now rushing by at speeds we only dreamed of as kids! After being guided down the Kilchis river by Chris Sessions, yesterday, Bill, Chris and I sat around the kitchen table, visiting with hot coffee and smoked salmon. Chris mentioned that as a child, you mark off the days till Christmas, every day lasts forever.... Not anymore! I am now registering shock on the "Uh Oh!" scale. Christmas! I'm NOT ready for this!!! We put in at the Logging bridge on the Kilchis yesterday, on a sort of scouting trip. I have wanted to do this for some time. It was really cold, but a propane heater and a beautiful Golden retriever to hug does wonders for a cold fishing trip. All I want for Christmas is a day where you hear "Fish on!" shouted all around you, but as all kids know.... we must be patient! It will happen! Last night I worked the midnight oil, so to speak. We have been enjoying garlic and basil flavored olive oil that I make, to brush on fresh French bread. I bought these cute little jars at a craft store, and some paint brushes to brush the oil on the bread. Now all I have to do is bake a bazillion loaves of french bread, tie them all up with pretty ribbons and wallah! Christmas presents for those neato friends that pop by! That and some vacuum packed smoked salmon? Yum! I feel so.... "Martha". I am preparing myself and Andrew for his surgery date next Thursday the 14th. We are going to try and make it as nice as possible by staying downtown in a motel. They shuttle people to Doernbechers and back, so it will be really nice. A nice dinner the night before... Nice.. Nice.... it will be nice, Andrew.... I am trying to convince him! O.K., off to find the perfect Christmas Tree, at the tree farm up The Trask river, and gosh, maybe I should start shopping for gifts for my family. I can do this! I can't do Christmas and fish too! Can someone please slow this train down? I thought I had the market on "dog excitement" when I'd say the words "Let's go Fishing!" However, Dee Dee, the black lab, knows the word "ducks!" just as well. She nearly knocks Bill over trying to get out the door and into the truck with that notoriously destructive, wagging tail that wiggles her whole body. Bill rose early yesterday, to drive over to the valley for a morning hunt. In spite of good conditions, the birds just weren't flying. Bill waited patiently for anything that resembled a bird in flight. Two missed shots all morning. Head down in defeat, his feet shuffled back down the railroad tracks towards the truck. Dee Dee raced along side, taking gleeful side trips, splashing in the trackside canals. A good hunting dog will never let you down. After one such absence, Bill turned his head to the sound of the dog running in full pace behind him. In her mouth she gently carried a large Mallard drake! Dee Dee, that big, proud, black lab was racing full force towards her master. "Look, Look, Dad!!! Lookit I found!" It was a very much alive cripple. That tail wagging black lab had herself the day's only catch! Can I take her fishing? Will she do that for me? The Contest winner has been picked! "Thank God, I'm alive!" Should make for some good reading. Ever been almost sucked under on the river? Run into some problems on the bar? Grab your lifejackets and read! I'm going to do the French Bread routine today, go shopping for wrapping material and do the Ho Ho thing. Dec. 11th later, night, dark, cold out. I rarely write this time of night. Tonight the world just seems too still. Restless, I had to move, to do something. I couldn't just sit in bed and read. I got up to stare out into the dark of night. The snow came at me like a thousand meteorites. There was a sheet of glass between me and the night sky, but my eyes weren't convinced. Blinking out the intrusion, I started lapsing into a sort of dream like trance. Christmas. Tis the season. A season of a thousand memories, a thousand good byes, a thousand feelings and powerfully mixed emotions. I used to have no patience for those who chose to be depressed during this season. But as life grows richer and fuller, as I have had more experience with life and death, I am more tolerant to these delicate feelings, yet I still stand firm in my decision to find joy. It is all so perfect. The lights are lit outside, reflecting down on the freshly fallen snow. The Christmas tree sparkles. It is the grandest I've had. A noble, standing ten feet tall, with the star fitted precariously on top, with the help of the balcony. The kids boots lay in a puddle in the entry way. A snowman stands proof that children, alive with the wild excitement of the season reside here. It is all so perfect, this Christmas season. The smell of fresh bread and the warmth of the wood stove surround me. Then why, sitting here in the dark, with just the glow of the computer screen and the flickering of a candle does a tear fall from my eye? When the first snow fell this morning, I reached for the phone to tell my Mother. We used to always do that. After realizing my error, I went to call Hershey, my dog, about the snow. He used to race around in it with me, tail wagging, body wiggling, crouching down to play. Hershey is gone now too. I took a breath and smiled through it. It was snowing, and in an odd peaceful way, I felt strong. In all that I have been through, the losses, the memories, the years of Christmas past, as they say.... I am still here to share with my children this very special, and very delicate time of year. Heaven, a place with no sorrow, no tears. Sounds pretty good. Off we go on another medical adventure! At least I like the "Off we go" part! It reminds me of drifting a river, giving up on one fishing hole and looking forward to the next. "Expect a fish with every cast". I forget that all too often. "Expect a fish with every cast". Now that is a great way to fish! We are off to Portland. Andrew's surgery is scheduled for 11:30 Thursday at Doernbechers. I am a little stressed about it, but I am sure it will all be fine. I just wish we could pack up and go somewhere else besides the hospital! A vacation about now sounds all too tempting! What fun it would be to help Andrew run away from this, to surprise him and drive instead to Mt. Hood, or Disneyland or....Alaska!!! I had a lovely drive yesterday. I was to meet R.T. and Mark on the Wilson. I hadn't been feeling well the night before, and had had very little sleep. I rolled out of bed and was immediately struck by the millions of things I had to do to prep for this surgery. Motel bookings, packing, Christmas gifts, surgery arrangements. I had all my fishing equipment out on the table ready to go when I got a phone call for urgent work to be done. This was the last straw! "I can't go, I give up". I told Bill, as I put the last ingredients into a new loaf of French bread. Bill went in my place. Twenty minutes later I was struck by overwhelming frustration. No way I could possibly get everything done, so I threw everything in a heap and left for fishing too! Driving down the Wilson, singing, with the music at top volume, I searched for their cars. Past the Guide Shop I went, headed for some secret fishing hole they would share with me. Down the Wilson River Highway I continued, round every bend, searching, searching..... I put my glasses on. RT? Where ARE you??? This must be really secret! Milepost 30. OK, I give. Guess I'll just fish by myself... Somewhere! Whoops! Bill's got the bait and I don't have any jigs with me! How can I expect a fish with every cast if I can't cast?!? Back up the Wilson I go, and I finally found them! Don't tell anyone where I found them. It is a secret hole called the Mill's Bridge drift! SHHH! My time, however, had expired and I traveled home to attack my list of chores. I will expect a fish with every cast now. Rain is forecast for this week, and when I get home.... my expectations may come true! Andrew is home and resting. I am home and too tired to fish, even though the Kilchis has the most beautiful color I have seen all year. It's perfect! Big wind storm coming in I guess. If you didn't catch the K today, you may be out of luck for a bit. I give up. Tis the season and I can't sleep past 4:30 or 5:00 A.M. I wake with a start. It is kind of like the "Where am I?" feeling, but I know where I am. I am laying in bed, ears keen... "Is it raining, or windy, or calm?" I start to remember yesterdays river conditions and then add this new data to my last memory. The information begins to all add up. It's calm this morning, and yesterday the river was beautiful. There is a storm warning out, but it hasn't hit yet. Will it hit before daylight or can I get a few casts in and beat the storm? I yawn, my body rebelling against this fishing compulsion. Stagger to the sink, and down to the computer for the latest weather information. Last night my weather station went totally bonkers, and I was up screaming at it till late. There is an alarm that goes off when winds hit above 70. I had never heard it until last night, in the middle of an otherwise calm, windless night. Curiously, I glanced over at it... Winds..... SE at 171!! Whooo hooo! Thats a big one! I laughed for a brief second, until the reality of techno fixes at 10:00 PM hit me. The display registered winds anywhere from 48 to 171! The weather station was having a party! Out into the cold, rainy night with the spotlight I went, clad in pajamas and Bill's slippers. I don't know what happened, it looked fine to me! When I returned, so had the sanity of the weather display. I guess it was the ghost of the winds to come? Chipmunks, using it as a toy? I don't know, but be warned, things may go whacko again. Andrew's surgery will never be forgotten. It was interesting, fun, scary, lonely, and adventurous all at the same time. The drive over hiway 6 was an adventure! We hit the snow at about milepost 32 or so singing Christmas carols. By the time we hit the summit we slowed to 10 mph and began singing hymns! Scary! We went shopping later that day, had lunch with my Dad, took too many hot tubs, and ordered way too much pizza. We laughed too hard, and walked to the mini mart across the parking lot, giggling, Andrew dressed in his pajamas! Woke the next morning to freezing rain and pitch darkness. It takes two of us to see at night when we drive. He has one good eye and so do I. Well, kind of good... We sat in the car at 7:10 waiting for light, knowing we had to be there soon. "I can drive... no I can't, yes I can." My confidence rose and fell. Car lights, city lights, cause streamers that make it very difficult for me to see anything but blur. I started out anyway, confidence at a high point. I made it about 1/4 a mile before I screamed, "I CAN'T SEE!" and pulled off into some office structure. This happened along the way several times before light came. We made it there on time, but it was a sheet of ice going up the hill to OHSU. Surgery was scheduled for 11, with a promise to be out at 3 or 4. Well, surgery was delayed, and he went in at one or two. I waited... and waited.... The one and a half hours turned to two.... and then to three.. Pacing the halls, I was filled with worry! Not only about Andrew, but about how I was going to drive him home! Everything went well, I ended up taking a taxi to the motel at around 8:30 at night, leaving my car in the lot. No hot tubs or pizza that night. Andrew was sick from swallowing blood, still very groggy, and very sore. I'm home though, and Andrew is recovering. I feel my job as a Nurse/Mom can take a break while I run upstairs, get dressed and wait for first light. I am tired, but that is just the way it is during this very fishy season. I can't sleep. I can't eat. I can't do anything, but think fish. It's a sickness, I am sure, but I don't think Andrew's antibiotics or pain meds will take it away. I am convinced there is no cure. Always save your work when you are writing on the computer! Argh! I spent about an hour writing a report last night and my computer locked up. Lost the whole thing. So frustrating! Off to fish the Wilson. I will let you know how things turn up. R.T. will be joining us! How fun! The winner of the contest is here! Please enter the new one on the discussion board quickly, because I will draw it on the 19th! That is tomorrow! Thank you so much to Roger and Lynn Anderson of Silent Approach for sending me some of the most beautiful jigs I have ever laid my eyes upon! Their website is up and running here: Silent Approach, I can't wait to try them. R.T. says they are excellent, and I can't wait to learn more about how to catch fish with these! I am bringing them with me today! Whoooo hooooo! Watch out fishiesssssssssss! Bill Heater and Chris Sessions took Kim Katsion of The Clam Gulch Lodge (in Alaska), along with Jeff and Damien out on a sturgeon fishing trip last weekend. If you want to book a trip to Alaska, you couldn't find two better contacts. Bill Heater donated the trip on the new trip trader board. What a sweetie! If you I guess they all had a really good time. Looks like it! This fish Damien caught was 43 inches! Someone left an Alanis Morisette tape at the logging bridge takeout on the Kilchis. I have all the words memorized now and I thoroughly enjoyed it. I'll give it back if it's yours! I woke Sunday Morning early, ready for the long drive to church. I plugged in the screaming tape of 'rock and roll' Morisette, revved my engine and headed out before the light hit the canyon. Thunder had kept me awake most of the night so I turned the music up for a little head pounding energy, and began singing along at extreme volumes. I don't know, it was something about love gone wrong. The sky was angry and beautiful at the same time. Against the dark sky you could see strong, turbulent clouds that told the tale of the nights unrest. In contrast, the bay was quiet, and swept clean of any boats. A sad reminder that the salmon season is over. The bathrooms at the Ghost hole long gone. My mind was busy. I stopped along the way countless times to jot down notes of where my thoughts traveled. Recently an opera friend wrote to me from New York telling me of the money I could make there as a rehearsal accompanist. New York. I remember being there, staring up at the buildings downtown that were so tall they would have touched these clouds I stared at. I was so in awe that tears came to my eyes. The noises of taxis, the beat of the city. I could live there, one part of me. I could live off of the excitement, the energy. I miss playing music with other musicians. But where would I fish? I like to dream. During an interview once the ever popular question was aimed at me. "Who influences your music?" Jennie, the girl with no straight opinions, with flipsy floppy moods, found this difficult to answer. Well, let's see... I'm screaming along to rock and roll, the bass booming through my head, the rhythm stirring my soul. I love rock and roll! I remember once playing an aria with a soprano. At the end, it was so powerful that I nearly fell of the bench. In fact, I think during the rehearsal of this particular piece, we both were on the floor, totally spent from how moving it was. There is a strange magical thing that happens when you are so in sync together. You breathe together, you proceed each others thought in music, you enter each movement together within a millisecond and crescendo, decrescendo at precisely the same time. Amazing, exhausting too! "I found a new drug!" And I really felt that way! I love jazz! When I play Mozart, I break into rag time. When I play jazz, I feel the urge to add a little Debussy. Back on the road again, I stop at the Necanicum. The parking lot is more full than I've ever seen it and curiosity kills the engine. I see a man I used to fish with 10 years ago at the 12th avenue bridge. He's got an extra rod, "Can you fish?" He pleads. I glance down at my velvet heels and my dress. Can I? If only for a moment? The thought makes me giggle. Who influenced this crazy urge to fish? Back on the road, music back on, I make it to the church parking lot. I am early and the church is vacant. I enter the quiet of the sanctuary and immediately feel the power of The One who created me, this crazy girl who knows not what she likes best. My Creator, who makes my heart sing. I sit down at the piano. After the raunch of rock and roll, the delicate sound of the piano soothes me. A George Winston style version of Silent Night comes from deep within me as I stare up at the crystal chandelier on the ceiling. It echoed a dissonance that begged to be resolved. Yet all is calm... all is bright. After church, I got in my car and drove all the way home without stopping. I come home to a vacation planner that I got in the mail from Alaska. Sitting at the kitchen table, half looking at birds in the yard, and half at the map that sits before me I see towns with no road access. I could live there in Alaska. I could leave all my belongings and live there along some river with nothing but my collection of fishing gear. I want to wake up to a Moose's head poking through my kitchen window! Live to fish. I want solace and peace. I want the thrill of a Broadway play. Rock and roll, jazz and classical music. I want to play solo piano, and then experience playing music with others. 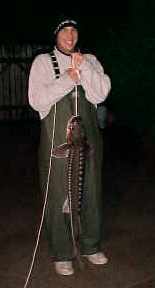 I want to fish in high heels and go to church in overalls. My family greets me when I come home. The Christmas lights lit, and the kitchen smelling of freshly baked bread that I had started that morning. I grabbed my rod and out to the river I went. The trees towering overhead, the sound of the winter water rushing past me. Beautiful green steelhead water at last! From a vantage point, high on the banks of the Kilchis, perched vicariously on a slippery log with binoculars in hand, I see them! I have a nursery in my own back yard! "Oh! There goes one!" The minute I arrived home from playing a Christmas party, I was lead to the river bank and up river a ways to see Chinook Salmon spawning! Lots of them! I guess I missed the real show. Bill and the boys had gone down to the river in my absence and witnessed 30 to 40 salmon in the riffles. Nature is amazing. After all of our worries that they would spawn out in tidewater, here they are! This does my heart so good. You can also see the grey spots in the river where they have dug and are digging redds. I take note where not to wade through the river later this year. Andrew suggests making signs to post where there are active redds so anglers will know. As I watch them, it is as if I am let in on a secret. I feel perhaps, as if I should look the other way. It's private, but I can't look away! Andrew notes he could stay and watch this all day. He keeps saying to me, "Mom! This is our back yard! I love the smell of the river... Isn't this amazing?" It is amazing! It feels more Christmassy to me than holiday malls or the shopping rush. It is a part of the reason for the season! You might have thought I saw Santa Claus soaring through the sky... Nope, just Chinook spawning, but the smile on my face was just as bright! In the midst of this wind storm, I am headed out to Portland to the eye doc and to Andrews post surgery checkup. Have a wonderful day, and I hope you see some salmon spawning this Christmas season! The river is going through a major cleaning cycle. The Kilchis is high and green, and I am going plunking! I will personally snag all of those leaves out of the river, and maybe..... just maybe.... a Christmas Steelie! I am inside eating a banana. What does that tell you? Yip, didn't touch a fish, and don't plan on going back this morning. . I think the water is too high and leafy. Tomorrow..... ah! Tomorrow! I saw lots of boats go to the park. Did they put in? I dunno! Maybe this afternoon the river will be perfect! It's flowing pretty strong right now. Bill is still out there someplace. We fished in different spots. Anyway, I'll keep you posted on Kilchis conditions since it is usually the first to calm down. It is Christmas Eve, all the packages are under the tree, I have a prime rib in the oven, vegetables all prepared for tomorrow's meal, bread in the oven, potatoes on the stove, presents to take to Wilsonville tomorrow..... Geesh! I think I am pretty ready! Do you know that absolutely terrified feeling that you have forgotten something? Like OOPS! I forgot to buy a present for my Dad! Or.... OOPS! I forgot to make hors devours? Or was I supposed to? I feel pretty calm, like I am all ready. This scares me! I want to sit down and have a drink by the fire. I see Bill doing that. But I am not a peaceful Christmas girl, no matter how much I would like to be! I want everything..... Perrrrrrrrfect! Candles lit, cinnamon and cloves on the stove to smell good... Now, if only I could get it to snow! I am going to send this off to computer land right now. Then I am going to go pour myself something to drink. Then I am going to be with my family. Laugh with them, love them, dinner will magically appear on the table. No it won't! Gotta go, the oven is buzzing! Merry Christmas to all, and to all a G Loomis! Oh! I got one for Christmas! I already opened it! I am going to hold it in my hot little hands all night, dreaming of rivers to drift and all the 'Fish Ons!' to come! Merry Christmas, really..... from the bottom of my fishy little heart! I CAN'T BELIEVE IT! OHMYGOSH! Thank you so much to everyone~! I don't know how this happened, but I got another G Loomis under the tree, thanks to you wonderful people at ifish! WOW! It is sooooo awesome! Bobber and jig, R.T., huh? Is that what it is for? Bobber and eggs? I had Andrew play like a fish at the tip and I nearly went through the roof! It is so sensitive! I love the feel of this rod! I am going to wear it everywhere! And the case is cool too, and and and WOW! I want to try it, OK? Now? Is it light yet? Now? What else did I get? Neoprene gloves, long undies, small tackle box, fish earings! Lures, jigs, fish napkin holders, all colors of yarn, a wood carving of a man fishing handmade by my piano student, and and and.... did I tell you I got a new G Loomis? You know that! Giggle! This is too much! It actually brought tears to my eyes! Is there really any truly blue foods? Santa gave the kids some kind of pop tarts that have blue frosting. Although I have finally lowered myself to eat one, I still stare at the color and feel ill at ease. Blue food.... Hmmmm. Blueberries are purple aren't they? Eggplant? Who cares. I am exhausted after the trip to Portland. Had to drop the kids off in Seaside last night to meet their Dad. That totaled 6 hours of driving. I passed up an offer to fish with Bill and a friend from the board. I must be tired! I stayed home today instead, to clean house and recoup. Even now, as I sit here alone, I wonder... Are they catching fish? Who is on the river? Why aren't they home? It must be hot today, and I'm missing out! O.K., truth be told, in between mopping and dusting I have been out to the river twice, but without a bite. The river is a gorgeous color. I tried rags, Marie's scent, shrimp, steelhead eggs, chinook eggs, pink corkie, red okie. All right! So I've been out there three times today. Maybe four? Saw Marie drive by twice. Saw Jerry Shipe, he came down to visit me, he saw a fish in the very waters I was fishing! Saw lots of boats go by, once right through the fishiest part of the hole. I had to try out my new rod today! Thank you! Thank you again! I threw a couple spinners down there too. I guess I have been down to the river 5 times today. Oh yeah, I tried floating a bobber through there too. I've got to go and get this place dusted and vacuumed. Nah, let's make it seven. What shall I try now? Now, top and foremost, let's get to Sollie Smith for the real challenge--the takeout. This is what makes The lower Wilson NOT a beginning run. If you can make it through this gracefully, and without being yelled at, you graduate! During the busiest times, at the end of the day, it is not uncommon to have 15 to 20 boats stacked up waiting to pull out. P.S. More than one reader has asked me..."Dear, who helped you write this?" Typical male response :) Anyway, I wrote it, and the information comes from what I have learned by listening to you! Remember..... Take your boaters test before Jan. 1 at Boatus.com. I just took mine. I am not proud that I got only 81% but I am pleased that I at least passed it! Wow! Took me about an hour, but I had to read alot to get to the end! I got a nifty online certificate too! As for me and my gear, I'm staying home! There are simply too many anglers on the river today! But, oh! What a gorgeous day to be out on the rivers! I did take a couple casts this morning, then got in my car and drove around to have a look. I met Bigstew on the board at the 101 takeout, and invited him over for a cup of coffee. Nice guy! I did a shuttle on the Kilchis today, stopped at the bridge and saw some absolutely beautiful, bright steelhead holding in the deeper pools. I feel sorry for these fish this year. I sure hope no one gets really crazy and tries to snag them here, or anywhere. It sure has been a difficult year. You know, every time there is a drought, fishing or weather, which seem to go hand in hand around here, the discussion board seems to get a bit heated. I think overall, however, that we have done immensely well! Kind of like a relationship through rocky times. We made it through the salmon season by looking forward to the promise of a bountiful steelhead season. O.K., we are here now. It's time. Now what do we look forward to? Will we make it through the steelhead season by looking forward to this great prediction of Springers coming at us? Are we going to just sit it out in these bleak winter months and twiddle our thumbs? It's time folks! We need to use this idle time to put our thoughts in writing. Send letters to your Congressmen and Senators. Get out there and help the hatchery people net and recycle fish, or whatever task needs to be done. It's a feel good thing! We can help, and gosh, we have such a nice big crowd on ifish, that we really could get things done! Imagine! Tie up rigs, polish your reels, put together different combos of reels and rods and try them out in your back yard! Oh! You know what I got in the mail today???? A beautiful G Loomis box FULL of Silent Approach Jigs! They are so gorgeous, you simply have to order some for yourself! So.... what I am going to do, is borrow a reel off of one of my other rods, put it on my new "ifish" rod and go out and give it a try. What if?? I mean.... What iffffff I catch one? WOW! There is a chance!